Ringnecks are unsuitable as "starter birds," and should not be placed in mixed species collections due to aggressive tendencies. Although they are being kept successfully with larger species in spacious aviaries. The aviary construction should be a steel frame with heavy duty wire netting (i.e., 16g welded mesh). As they like to chew, wood construction is unsuitable for them. For adjacent flights, double wired partitions are needed, as they will attack those that hang on to the wide of the aviary, causing damage to their feet and beaks. For better breeding results, consider visual barriers. 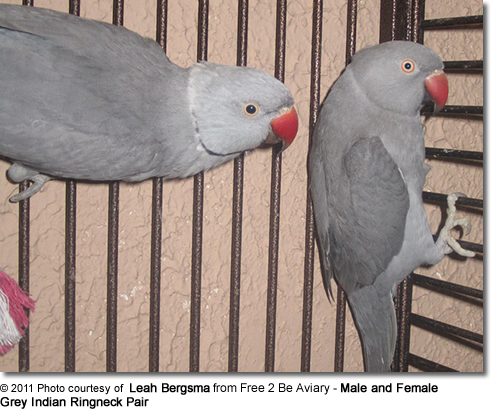 Ringnecks are active birds that do best in large flights or aviaries that allow them to fly and exercise. A good size flight would be 10'x 10' x 15' (3 x 3 x 5 meters). The minimum length of a flight should be 7 feet (2 meters). They need a suitable sheltered area that protects them from draft, cold weather and rain. In warmer areas, this can be achieved by covering part of the aviary (both the sides and the roof) with clear or opaque corrugated roofing material. The rest should be kept open to give access to sun and rain. Those kept in colder climates may need a heated sheltered area as they are susceptible to chilling and frost bitten toes. Non-toxic leafy branches make excellent perches and should be placed at both ends of the flight for them to chew and perch on. The Ringnecks will chew any leaves, flowers and fruiting bodies off, as well as gnaw on the wood, which provides entertainment and good beak exercise. These branches will need to be replaced regularly. If the birds are kept in a communal / aviary setting, it is best to separate breeding pairs for the breeding season, as they will be more aggressive during this time. Best results are achieved if each breeding pair has its own flight, ensuring that the pairs can't see each other. As these birds don't form strong pair bonds, they may "flirt" with birds in other aviaries which could potentially interfere with breeding successes for both pairs. This being said, it is possible to keep two pairs in a large flight - however, both pairs need to be introduced into the flight at the same time to prevent territorial aggression. Ringnecks usually only raise one brood a season - although if one clutch is removed for artificial incubation or lost for whatever reason, the female will usually lay another clutch to replace the previous one. In warmer areas of the world (such as southern USA, South Africa and Austalia), they regularly produce two clutches. It is important to discourage breeding when temperatures are still chilly as this increases the chance of problems, such as egg binding, chilled eggs or chicks, or dead or crippled chicks. Breeders may remove the nesting boxes or seal the entrance holes to the boxes until weather warms up to discourage early nesting. Additional recommendations for discouraging hormonal behavior in birds. It is best to provide two nesting boxes for each pair to choose from. The nesting birds may show a preference for a nest box of the type and size they themselves were hatched and raised in. If this information is not available, providing nestboxes or logs of various sizes and types, and placed in various locations within the aviary, may make it easier for the parents to make their choice. The nest box should be situated in a sheltered part of the flight, about 5 - 6 feet (1.5 - 1.8 meters) above the ground. It is important, however, to not place the nest box too close to the roof as this could result in heat problems during the summer. Once a pair has chosen their favorite nest box, it should be kept for their exclusive use. Any others can be removed at this point. At the end of the breeding season, their nest box should be thoroughly cleaned and sanitized. Nestbox: About 7 - 10” wide x 7 - 10” deep x 18 - 30” high. As these parrots are heavy chewers, the box should be made of a thick timber or 3/4-1 inch thick exterior quality plywood. Depending on the depth of the nest box may require a climbing structure inside the box just below the entrance hole. The nest box should have a removable top / lid to facilitate nest inspections. Entrance hole: Can be either square or round, with a diameter of about 3 inches (75 mm) diameter. The entrance should be about 4 - 6 inches (~100 -150 mm) from the top. Suitable nesting material should cover the bottom of the nest box, such as soft sieved sand, safe (non-toxic) saw dust, pine or wood shavings, dried plant material or other suitable materials. A clutch may consist of 3 to 5 white eggs. In some instances, only 2 are laid, or as many as 6 eggs. The eggs are laid one every other day. The incubation may not start until two or more of the eggs have been laid. The incubation usually lasts between 21 - 24 days. The female incubates the eggs alone, while the male feeds the brooding female. The hatchlings are blind and naked, and depend on their parents for warmth and feeding. The parents will need to be provided with plenty of food to allow them to feed their growing, hungry chicks. These parrots generally tolerate nest inspections quite well, and the nests should be inspected daily to ensure the wellbeing of the chicks. Once the chicks are 7 - 10 days old, breeders will generally place closed metal leg rings on one of the chicks' legs for accurate record keeping or as proof of captive-bred stock, in areas where this is required. Those chicks destined for the pet market should be well socialized to ensure tameness and good pet qualities. The young usually fledge when they are about 6 - 8 weeks old, but they still depend on their parents for another 3 - 4 weeks. They can be left with their parents for 6 months or longer. As the parents get ready for their next breeding session, aggression towards their previous young may occur, at which time they will need to be removed.